We are proud to announce that our Group Chairman, Richard Butterfield, has been recognised as a game-changing, innovative entrepreneur in this year’s Maserati 100. 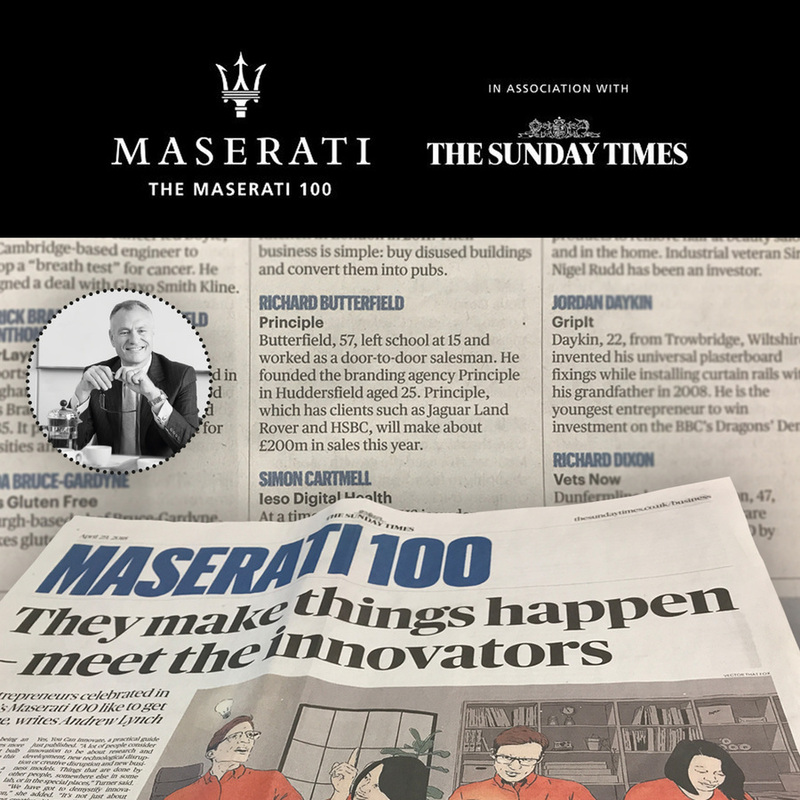 Partnering with The Sunday Times, the Maserati 100 is now in its fourth year and is dedicated to celebrating the positive impact entrepreneurs have on the economy and society as a whole. "Maserati was founded over 100 years ago by the Maserati brothers who were entrepreneurs and innovators of their time, and were passionate about nurturing entrepreneurial spirit. This year, the theme is ‘innovators’ as Maserati celebrates 100 entrepreneurs who have contributed original thinking to their industry. Innovation is about executing the [big] idea — converting the idea into a successful business. Usually, managers equate innovation with creativity. But innovation is not creativity. Creativity is about coming up with the big idea. We are recognising entrepreneurs who have had a big idea and converted it into a successful business, as Richard Butterfield did after leaving school at just 15, and founding Principle just 10 years later. Now 57, Richard has nurtured Principle, helping it to grow and flourish; and this year the company is projected to make £200m in sales." Find out more about Richard here.